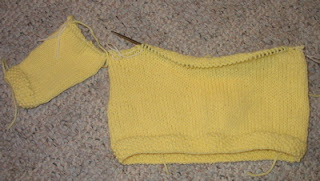 I've got three projects going this week, the first is the Candle Flame Shawl from Knitpicks. I'm using the hand dyed merino from my LnV magic yarn ball swap. Progress so far, the border and half a repeat! It's one of those turn off everything and concentrate, pattern in my lap the whole time kind of things. Yikes, but no deadlines at least. And since I needed something mindless for in front of the computer and in the car I started a pretty basic sock. This is some yarn I received in a trade with Mama-E last fall. The color is Koi. 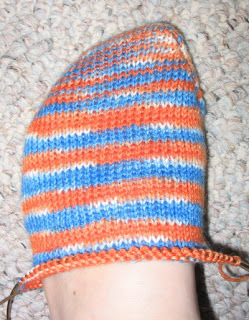 The stripes are actually spiraling up the sock. Not my usual colors, but that's why I like it. 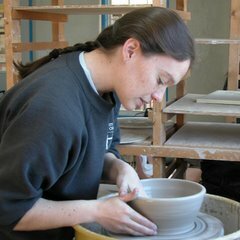 Today is a firing day in the pottery life. Usually that makes for a very late night, but I got a good early start, so I'm keeping my fingers crossed. Hope I get a nap! I've got a little more glazing to do for the next loads. But so far everything is on schedule. Everything looks great. I really like the sock colors. Mama E does some *good* stuff! Good luck with the firing. Sounds like a big job! My sarah sent me your sock pattern and two balls of yarn for mother's day so I think I'll join the sock club....having made many knit thing but no socks! ooh nice colours... and it's from the toe up!! !